These 'Hot Fix' fibres will easily bond to themselves with the application of heat to produce a non-woven type of fabric. 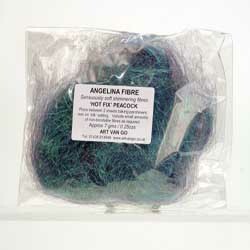 Bonding occurs when the ‘hot-fix’ Angelina fibres soften and fuse together. Endless varieties of colour blends and densities can easily be achieved to create unique, sparkling surfaces for any creative project. Once created, treat the sheet as a non-woven fabric.